The Fill Buckets button in the bottom left corner is designed to give you quick access to moving income to expense buckets. Each time you add a deposit transaction in MoneyWell, you can fill your buckets with two clicks. If you want, you can let MoneyWell drive and choose all the bucket amounts or you can tweak the list to your heart's delight. You can change any bucket amounts up to the total of the available income. If you exceed the available income, the Fill button will be disabled until you lower one or more amounts. When you save your fill amounts, MoneyWell will create bucket transfers from the income to the expense buckets. These bucket transfers are marked as automatic and will be include in the filled amounts the next time Fill Buckets is used. Instead of changing the the bucket amounts directly, you can set the amount by selecting the events assigned to that bucket. If you click the event count button in the Events column, MoneyWell will display a popover showing all the events for that bucket with the ones that have been filled disabled. As you check fill events, MoneyWell increases the fill amount. The total fill amount will be used to fill the events in priority and date order when you save the Fill Buckets panel. How Does Fill Buckets Work? 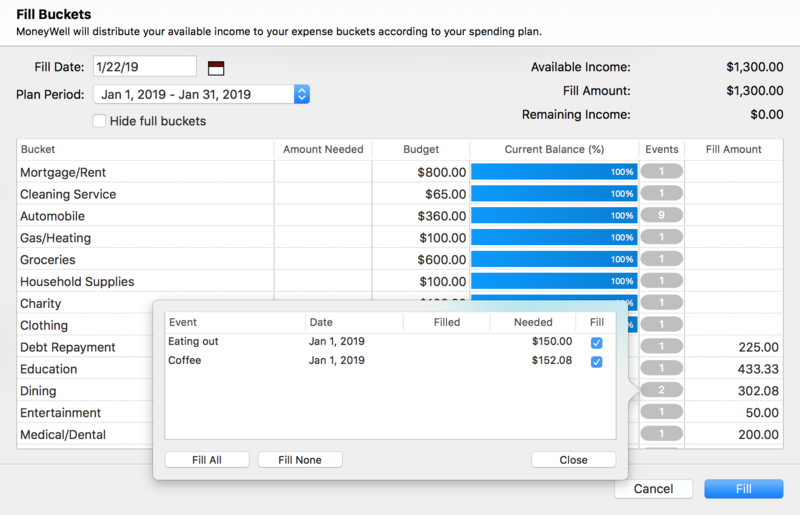 Fill buckets looks at your available income and your budget events and puts money in your expense buckets so you have money available when you need it. The "Fill" setting on each event drives the fill schedule. If you leave it set to "Every Event Date" then it uses the "Repeats" setting for the event. You control the priority of how events are filled by dragging them up and down the list on the Spending Plan view. MoneyWell respects your priority and uses that for deciding which fills occur first on each day of your plan period. Make sure to select All Transactions and sort the events by "Priority" before trying to rearrange them (see Reordering Events by Priority). This process allows you to tell MoneyWell that the Rent bucket needs to be filled as a priority with a "Pay Rent" event on the first, while other events get the leftover income. If you have weekly grocery events, MoneyWell will fill each week in order with other fill events. This means that a middle of the month electric bill event will get filled before the weekly grocery fill events later in the month. If you have enough income at the start of the plan period to fill all your events, MoneyWell will do it. Remember that envelope budgeting is all about dividing up your income when you get it so you don't see a pile of money in your Salary bucket and think you can spend it on anything you want. To learn more about repeat settings on events, read Setting Recurrence Rules. When Do I Fill Buckets? Basically any time you add money to your income buckets, you can fill your buckets. You can click Fill Buckets at any time and MoneyWell will present you with the Fill Buckets panel so you can see what can be filled. You can't hurt anything by trying to fill buckets. Before you use Fill Buckets the first time, you should set your Starting Bucket Balances to make sure your initial bucket balances and cash flow start date are correct. MoneyWell will never touch your manual bucket transfers—the ones you create by dragging one bucket to another or by using the New Bucket Transfer context menu command. Whenever you alter the date or the amount of an automatic bucket transfer, MoneyWell will change it to a manual transfer so it sticks around. You can look at bucket transfers by selecting one or more buckets on the Cash Flow view. An automatic bucket transfer is shown in the list with nothing below the from/to bucket title. A manual bucket transfer shows "(manual transfer)" on it. Automatic transfers are used by Fill Buckets to decide if more money is needed to meet your budget needs. Manual transfers are ignored and can be used to redistribute money between buckets without causing another fill to occur. For example, if you have a $200 event that fills twice a month, MoneyWell will create two bucket transfers if the income is available before the fill event dates. If MoneyWell adds an automatic $100 bucket transfer and then you add $50 to the bucket with a manual transfer, MoneyWell will still add another $100 automatic transfer when there is available income. If manual transfers weren't ignored by the fill buckets process, you wouldn't be able move money around. If Fill Buckets doesn't use all your income, it could be that you have one or more of your income buckets excluded from the process. Double-click on each income bucket in your list and make sure that "Include in Fill Buckets" is checked. Also make sure that your expense buckets that you want to fill have this option active as well. Another potential issue is that you have your expense buckets assigned to fill from a specific income bucket and that bucket is empty. 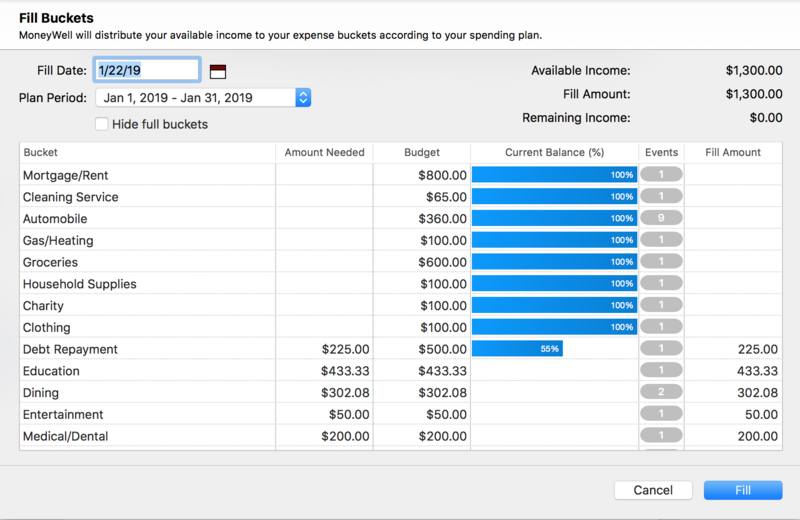 Even if there is money in a different income bucket, it won't be used if there aren't expense buckets to set to use any income bucket or assigned specifically to that one. You also need to set up Spending Plan Events or MoneyWell won't know how much to put in each bucket.